1935: Company 531 at Camp F-132 (Big Creek) of the Civilian Conservation Corps completed the construction of a 20-foot round native timber tower with an L-4 cab. 1922: 10-foot pole tower with a metal cupola. June 27, 1930: "Forest Ranger T.R. 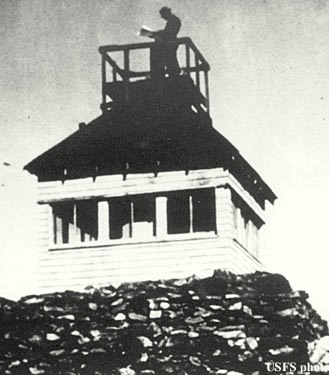 Peterson, stationed on top of Granham Peak as fire lookout and his partner, Eric Swanson, smoke chaser, had a merry time of it early in the week during severe electrical storms in this district. One bolt of lightning took the tower off the lookout station, split the roof and played havoc with the entire structure, it was learned here today. The rangers escaped injury but do not care for a repetition of the experience. 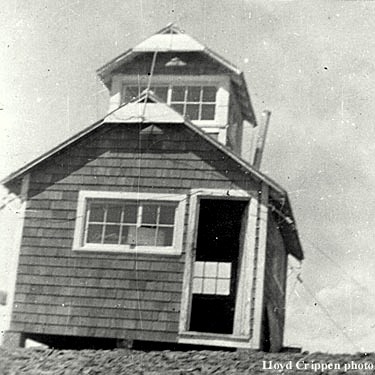 ​July 28, 1931: "Construction of a new tower and observatory on Graham peak was completed yesterday by forest service employes, Ed F. Helmers, senior forest ranger, reported last night. 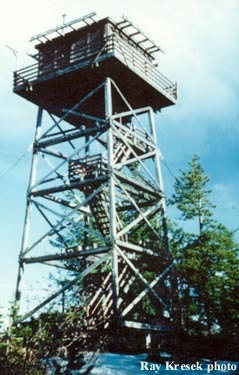 The lookout is one of the most modern in the northwest and gives a greater visibility than any other station in the Coeur d'Alene national forest. 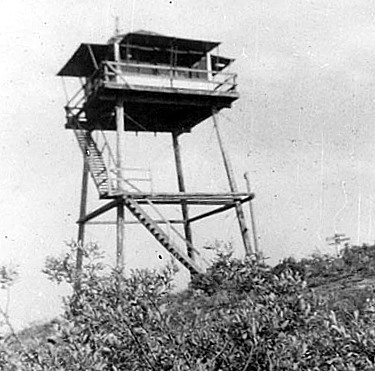 c.1933: 60-foot patrol tower with L-6 cab added. 1919: A frame cabin with a platform on the roof. For later structures see Little Guard Peak. 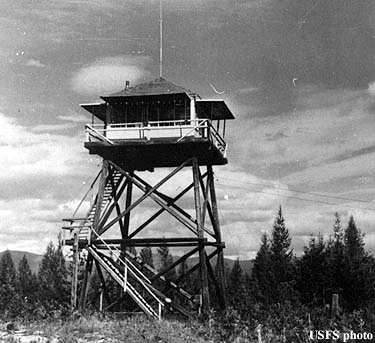 June 17, 1953: "The Lindroos Hill lookout station east of Mullan will not be used this year, Forest Ranger J. E. Sanderson reports. He said the station will be dismantled because it is becoming unsafe but that the picnic area surrounding the site will be cleaned and enlarged for public use. 1957: two-story, L-4 cab atop concrete lower floor. December 22, 1928: "Because Clair Corey, 19-year-old fire lookout for the Coeur d'Alene Timber Protective association was on top of a mountain when killed by lightning his parents are entitled to compensation, the state industrial accident board decided Friday.